Here are the original Stripping guide and a snake guide. The red thread wraps looked good on the rod. The rod was a 9 foot model 55 South Bend. Some checking around disclosed that in good condition (which it wasn't) it might be worth $50 on the antique rod market, so I felt free to do whatever sort of rebuild made sense to me. I opted to strip it completely and rebuild it with modern components. Much larger guides are favored today because modern plastic based fly lines are larger diameter than the old silk lines contemporary with the rod. Also I have understood it was of the “economy” end to the South Bend line; it was rather economical on the number of guides--seven. For the rebuild I used ten. Stripping it down went pretty easily. The cork grip just crumbled off in my fingers. I did have to saw the reel seat to get it off. The guides came off with a little careful work with a razor blade. Some heat applied to the tip top took it right off. I used a paint stripper for furniture to take off the varnish. That took a couple of hours of work to get it clean. 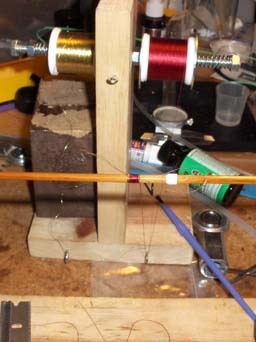 Before I started the rebuild I evaluated the rod for line weight using the “Common Cents” method and it came out as a 7 weight with an action angle of 56 degrees which classifies it as very slow. 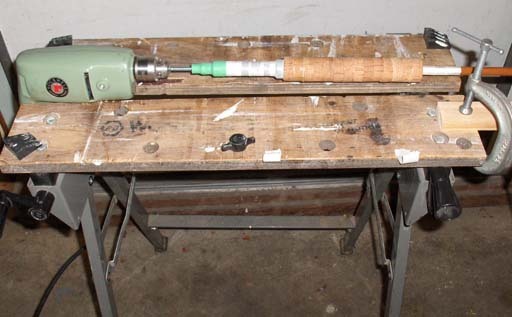 A rod of this weight is on the dividing line between big game rods which have fighting butts and all metal reel seats and the lighter rods which use wood reel seats and no butts. I decided to go with the lighter approach except that I favor the big game style of cork handleundefinedthe full wells styleundefinedfor all rods that I use. So below are the steps in the assembly. The rosewood insert is glued in place followed by the rest of the reel seat. Cork rings are glued in a stack in front of the seat and clamped until the glue sets. I used a urethane glue that expands and fills the voids in the cork. Here is the lathe setup I used to shape the grip. There is a bearing out of sight to the right which holds the end of the rod. Holding a strip of sandpaper against the turning cork does the job. The next problem was what sort of finish to apply to rod and the wrapping of the guides. The classic approach was to fill a long piece of pipe with spar varnish, dip the rod in it and withdraw it slowly at a constant rate. Then it would have to dry in a dust-free space for several days. These requirements did not add up to an attractive prospect. Fortunately there is new stuff called Perma-Gloss which is a kind of urethane varnish intended for coating rod wraps that sets and dries in about half an hour. A single brushed coat turned out to be quite satifactory for coating the rod itself and multiple coats on the wraps built up to a rather nice transparent finish. Below is a view of the process of putting on one of the guide wraps. I chose a deep red Gudebrod threadundefinedGarnetundefinedalong with some gold thread accents at the end of the wraps. Below are a couple of guides as wrapped and finished with multiple coats of Perma-Gloss. Note the nice transparency. So what's it like to cast and fish? I haven't fished it yet, but I have cast it. It is pretty heavy in the hand compared to contemporary rods. The action and behavior might be described as rather stately--it doesn't like to be hurried. The tip has a tendency to oscillate and open up the casting loop if it is too abruptly stopped. This is a consequence of its weight. These days the more favored bamboo rods, both contemporary and classic, are for lighter line weights and are shorter than this rod. One thing it does do well is throw a shooting head. I am inclined to take it on my next trip to the Klammath and see if I can take a steelhead or two with it.